I am DEEPLY immersed in RRCA Training while you read this, Self High Five. I am not sure that I have ever explained WHY I want to be a running coach..
1. I always thought I would be a coach, a basketball coach. I tried and was not hired by my alma mater High School, it was a BLOW to my ego, so I ran off to get a Big Girl job. Through running I can coach and bring home the bacon, win, win. 2. When I first started running I was INSPIRED by the ladies in my office, they helped me stay positive and gave me something to look forward to. I need to PAY IT FORWARD. 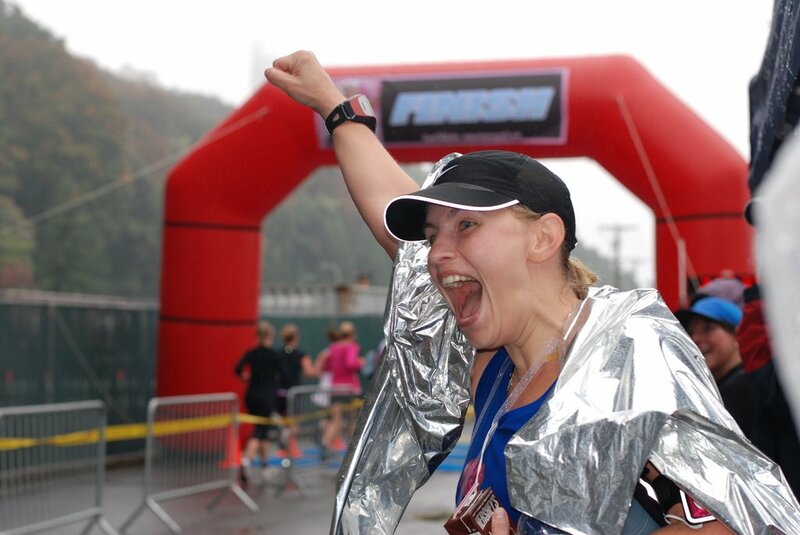 Being a coach I can help women, young girls and runners close to PR's reach their dreams. From pacing Jill and T I can tell I am truly going to enjoy being a coach. 3. I am a NEW runner, with just over 2 years since I ran my first Half Marathon. I have so much to learn. In order for Tall Mom to be LEGIT (with badges all laminated and what-not) she needs to get some training! The You Go Girl folks posted a few new photos that I am in LOVE with!! These photos drive home that the WA Bloggies are AWESOME!! 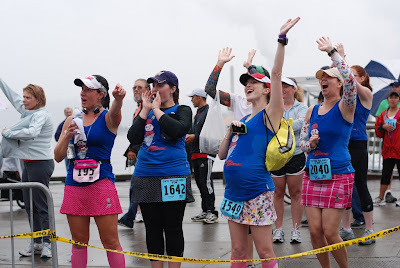 It was freezing, raining and they were out there cheering like mad, Zoe even took a video of me and T. I hope she posts it on her Blog..
Look at Jill HERE, so excited to cheer Diana to the finish. Emz HERE recap of her 50 miler!!! I hope you are loving the coaching training! You will be a FANTASTIC coach! Iknow you have a lot to offer to the runing community. Put me down next week for the Toronto Marathon on Oct 17th. EEEEEEEEE! To say you have Paid it forward is probably the biggest understatement ever. You have inspired so many. Absolutely amazing. I agree wholeheartedly with Emz, you're awesome. wait, you didn't just start running two years ago, right? But still, it's only been two years since your first half and you've done so much?! Another reason why you inspire me! You are going to be an amazing coach. I can't wait for the opportunity for you to assist me with a PR. Just knowing you has inspired me to do better. Thanks for the High Five!!! It made my day. Lots of Portland marathoners on this list. Hopefully I'll see you out there on the course cheering. I still don't have my route completely picked out but I'll probably park myself between miles 4-11 and then go up to mile 18ish and then to the finish. You'll love coaching. It's great being able to share a passion with others. I have a 5K on Monday. It should be interesting after the weekend 20 miles. I know you'll enjoy your training. Hope to see you Sunday morning. I'm not liking the weather forecast at all!! Your reasons for being a Coach are perfect and you are going to be a great one! Probably won't be able to afford you, but I would love to run with you someday! See you this weekend! Thanks for the high-five love! Have a good weekend coach!! Can you be my free coach? Love the picture at the top of the page! I guess I hadn't noticed it. You're already paying it forward by encouraging so many through your blog. Coaching will be a great addition...and you're right...it's always good to know more about what you're doing and why. You're going to do great! Rock that training girlie!!! That's awesome that you're becoming a coach... you'll have to fill us in more of what the whole process is like. Its something I'm fairly interested in once I've been running consistently for awhile longer. And I've got the Indianapolis Half Marathon next Saturday, the 16th... and the Monumental Half Marathon on November 6th. Yayyy! THanks for the high 5. I'm ready to rock it! Great reasons to do the RRCA training! And those pictures are awesome. One of these times I'm going to crash one of your blogger meet-ups! 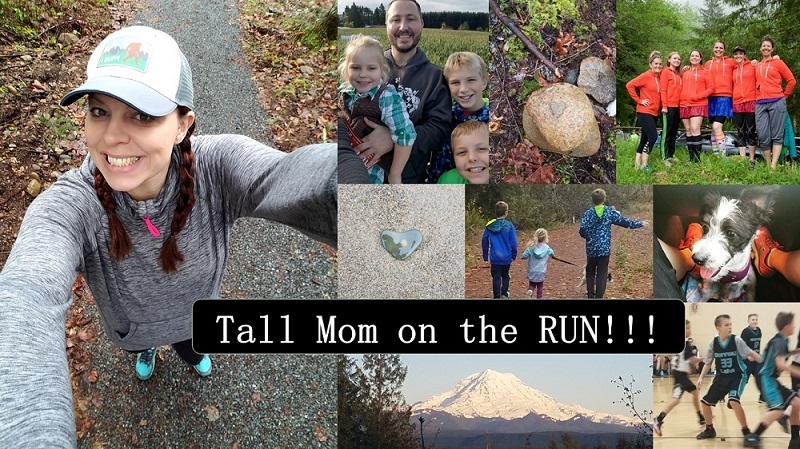 You'd make an excellent running coach, at least from what I know of you through the blog world! Can't wait to hear more about the course once you're through.